More recently business and corporations have been strongly criticized for not always being able to conduct their commercial and operational activities in an ethical and socially responsible way. Criticisms have also involved the capability of the current accountability and control systems to provide adequate information to account for and report on these practices. In particular, accounting and accountability systems have been challenged for not serving the interest of the public, that is, to act for society’s wider interests. In the accounting/accountability literature, in particular, calls have been made for envisaging “innovative” accounting and accountability systems which act as social means for promoting society’s main interests. Such forms of accounting and accountability are conceptualized as means for activating some form of emancipatory change, in the relationships between business, society and the environment. In order words, this debate has called for the need to reconsider the “ethical” foundations of accounting and accountability systems and practices. This chapter contributes to this debate by proposing a conceptual model which could help to illuminate some of the complexities of the relationship between accounting/accountability and business ethics. This model, which is based on a “metaphorical merger” between ethical firm system theory and stakeholder management theory (Rusconi, Eur Manag Rev 1–20, 2018), is able to highlight the ethical responsibilities of the management of the firm system, the rights and duties of every stakeholder and to identify the dialectic nature between “pure” or “instrumental/strategic” ethical legitimacy. The implications of such a model for improving the process of ethical and social legitimacy of the various accounting and accountability practices are then addressed. Increasingly over the past years, business and corporations have been criticized for not always being able to ensure to act and conduct their commercial and operational activities in an ethical and socially responsible way. For example, events such as those related to Enron and/or Parmalat at the beginning of the 2000s, the credit crunch at the end of 2008, and/or more recently those related to the unethical behavior of the so-called dieselgate, which has involved companies such as Volkswagen, have dramatically impacted on the institutional environment within which corporations and business conduct their activities. These events have affected the stability of the global business market (e.g., financial) by generating in the public the idea of lack of trustworthiness and weakness of the current governance systems to ex ante prevent and subsequently deal with these unethical and irresponsible practices. Criticisms have also regarded the capability of the current accountability and control systems to provide adequate information to account for and report on these practices. In particular, accounting and accountability systems have been challenged for not always being able to serve the interest of the public, in other words, for deviating from societies’ wider interests. In the accounting and accountability literature, in particular, calls have been made for envisaging, designing, and implementing “innovative” accounting and accountability systems which act as social means for promoting society’s main interests (Gray 2002). Such forms of accounting and accountability have been conceptualized as able to activate emancipatory forms of change (Gray 2002; Contrafatto 2004, 2009). These accounting and accountability systems, which are mechanisms for promoting emancipatory change in the form of understanding the relationships between business, society and environment, should be able to gather and provide information for preventing or reducing the risk of unethical and irresponsible behaviors. In other words, this debate has called for the need to reconsider the “ethical” foundations of accounting and accountability systems, which are really for the interests of society and stakeholders. This essay contributes to this debate by proposing a conceptual model which could help to illuminate some of the complexities of the relationship between accounting/accountability and business ethics. In particular, the aim of this chapter is to apply a conceptual model to accounting/accountability, which is the result of a metaphorical merger between a specific version of stakeholder theory and a systemic view of business ethics. Such a model, it is argued, would be able to contribute to address some of issues related to the relationships between accounting, accountability and business ethics. The implications of such a model for improving the process of ethical and social legitimacy of the various accounting and accountability practices are then discussed. In particular, these aspects are discussed with reference to two interrelated forms of accounting: management accounting and external accounting. As widely understood, management accounting is seen as a set of practices and documents which are mainly used to support the decision-making process of the management. The second, on the other hand, represents the set of practices and documents which are instead produced, published and presented externally to all interested stakeholders and are regulated by law and accounting principles (very often indirectly empowered by law). The accounting information that is produced by accounting systems is fundamental for the process of accountability. In the literature, accountability is conceptualized as a multiple responsibilities-based framework which provides the rights and duties in the relationship between two subjects: the principal and the agent (Gray et al. 1996; Contrafatto 2009). On the one hand, the principal is the subject that holds the rights and the resources for “instructing” what is required and/or expected from the agent. On the other hand, the agent is the subject (individual or collective) who has the “duty” to act on behalf and for the benefits of the principal. As explained by Contrafatto (2004, 2009), at the core of the accountability framework, therefore, there is the idea of the “ability” to provide “accounts” for the actions, and results, by the agent. It is clear that at the center of this framework, there is a need to provide appropriate accounting-based information. Without such information, the accountability mechanisms would not be possible. In the accountability literature, such information should be neutral, complete, transparent, correct and fair. It seems evident that the accountability mechanisms, and the role of information within them, will manifest in different ways in relation to the different “types” of accounting (Gray 2004): the accounting for internal managerial purposes and accounting for external disclosure (this will be discussed in the following section). The accomplishment of the accountability duties to provide and disclose information is relevant not only from a strict business ethics point of view but also from a legitimacy-based perspective. Social accounting, where the multidimensional and different kind of documents that exist could give more space for manipulation/instrumental ethics and legitimacy. The remainder of the chapter is organized as follows. In the next section, we address the issues related to the interlink between accounting ethics and legitimacy. The third section discusses the concepts of legitimacy and legitimation in the context of ethics accounting. In the fourth section, we introduce and describe the heuristic model. In the final section, some final remarks are reported. In this section we will address the issues of the relationships between accounting and ethics, with reference to the three forms of accounting mentioned above: management accounting, financial accounting and social accounting. Management accounting is described as the branch of accounting which focuses in particular on the process through which accounting-based information is produced to support the managerial decision-making process. As emphasized by Drury (2008), management accounting information is mainly produced for internal users (i.e., managers), who need this information for deciding the most effective and efficient allocation of resources for achieving the operational, tactical and strategic objectives. Therefore, management accounting could be seen as a sort of “free-zone from any ethics” (see Gauthier 1986 regarding free-zone from ethics in economics and business) considerations. Indeed, any misuse or wrong “calculation” seems to be inconceivable, because these misuses, wrong or unethical actions would produce damage for the management. However, we argue that such superficial analysis would require further and deeper considerations. Since management accounting information can strongly influence the behavior and the focus of managers in their relationships with other stakeholders, we argue that it is possible to see a space for ethical considerations. There are, indeed, several situations where the decisions taken by managers, drawing on information generated by management accounting systems, will have an impact on other relevant stakeholders, for example, employees and investors. For instance, in situations of “make or buy,” i.e., where assessment of whether it is more convenient and/or efficient to outsource part of the production process, the information generated by management accounting systems will be pivotal. If the management accounting practices are not carried out in a responsible, rigorous and ethical way, these will generate “disguising” information, which, in turn, will lead to “erroneous” decisions that potentially affect other stakeholders, such as, in the above example, employees. From this perspective, it seems important to talk about “ethical principles” in the way in which management accounting systems and practices are designed and implemented. These ethical principles should be able to guide the controller in the implementation of a system that is managed in a correct, transparent and responsible way. In addition, the same principles should be applied to guide the management accountant in the decision-making process, which should be undertaken in a responsible way. This implies that the management accountant, in deciding whether or not to undertake a certain action, should ensure that the decision is grounded on a transparent, fair and responsible set of managerial considerations. In other words, these ethical principles, therefore, should be seen as guiding principles not only in the designing and implementation stages of the management accounting systems but also in the subsequent process of decision-making. As a result, these principles will contribute to make the management accounting systems, processes and procedures more legitimate. In this sense, legitimacy should be seen in the form of trust, reliability and plausibility of the entire management accounting-related processes. Lobbying of accounting principles and regulations. Earnings management (hereafter EM) has been widely examined, particularly in connection with the effects of the cost of capital and/or economic resources allocation (Merchant and Rockness 1994; Healy and Wahlen 1999; Zahra et al. 2005; Martinez-Ferrero et al. 2016) and in connection with the positive accounting research (Watts and Zimmernan 1978, 1986). EM practices occur when “management’s use of judgement also create opportunities for ‘earnings management’, in which managers choose reporting methods and estimates that do not accurately reflect their firm’s underlying economics” (Healy and Wahlen 1999, p. 366). Clearly aggressive and not fully legal accounting politics (e.g., to present a real annual expense as capital expenditure): in this case, compliance could be done simply for avoiding penalties and criminal issues and not for ethical considerations. This is what happened with the “creative accounting” practices which emerged in various famous scandals such as Enron and Parmalat. Voluntary but evident bias when accounting principles leave a discretional power to the firm in accounting valuation: this creates space for ethics. Avoiding bias only for avoiding the risk to be punished and for pursuing an instrumental legitimacy rather than for a real ethical awareness. In this case, there is an issue of ethical misusing of lobbying power by companies or associations of firms or professionals, which could foster official legitimacy by the public, but in the cases of evident bad results of this macro-manipulation, it could risk a big decline of public trust in the whole system of accounting regulations. Social (sustainability) accounting has been described as the part of accounting which is involved in producing information about the social, environmental and ethical impacts of the economic and operational activities undertaken by organizations (Hibbit 2004). As explained by Gray (2004, p. 80), social accounting represents therefore “the universe of all possible accountings.[…]. social accounting covers an enormous range of issues- not just all of accounting and finance but labour law, ecology, carbon trading, theories of justice. […]. The issues we are concerned with are exceptionally complex- the relationships between human culture, information, economics, business, morality, the planet and society.” At the root of social accounting, as it has been described here, there is the normative framework of social accountability. It is through the preparation of social accounts and the disclosure of social and environmental information that the several stakeholders are potentially able to assess and evaluate the actions and initiatives that are (are not) undertaken by organizations in their commercial and operational undertakings. From these preliminary considerations, what seems to emerge is how the issues of ethics play an even more important role in the context of social accounting. The substantial lack of an overall and encompassing regulatory framework implies that there is the need to ensure that in all stages of the social accounting process (design, preparation, diffusion and auditing), there are always clear and transparent procedures, rules and frameworks which have been followed. In particular, it would be essential to avoid misuses of social accounting reports and processes, which, instead of being used for genuine forms of accountability, become tools which are instrumentally used by organizations and/or managers (Owen et al. 2000) to manipulate the impressions of several stakeholders (e.g., through forms of impression management) and/or image re-lifting. Hence, social accounting documents (e.g., sustainability reports, ethical documents, etc.) are required to be prepared and disclosed in a responsible way, i.e., they need to be prepared and used as genuine documents of accountability, rather than as instrumental documents for some opportunistic interests of managers and organizations. In this section, we have briefly discussed issues of the relationships between accounting (in its several forms) and ethics. We have also seen how these different forms of accounting have implications for legitimacy. In the following we introduce and conceptualize the concepts of legitimacy and legitimation. Firstly, it emphasizes that the complex and articulate relationships among all different stakeholders (top management included) always imply a very open approach toward the accountability legitimacy processes by and among all stakeholders. A Stakeholder-Based Model: What About Ethics and Legitimacy of Accounting Practices? The stakeholder perspective developed from the work of some precursors (various precursors are indicated in Freeman and Reed 1983; Freeman 1984), who anticipated some partial aspects of this perspective. Originating from the strategic disciplines (Freeman and Reed 1983; Freeman 1984), stakeholder management theory (hereafter SMT) has widely diffused since the 1990s to impact on other related disciplines, for instance, business ethics, marketing and accounting (Freeman et al. 2010). SMT was applied, more or less consistently, to disparate fields of knowledge, from sociology to public management and politics (Phillips et al. 2003). At the outset it should be noted that SMT should be understood as a “good useful idea” (Freeman 2005, p. 423) that forms a genre of theories (Freeman 1994; Freeman and Phillips 2002), which draw on six main theoretical concepts/principles. These will be discussed below. SMT6) SMT is neither a socio-economic or political theory nor a comprehensive ethical theory. The need to refer to a specific ‘normative core’, therefore, follows (Signori and Rusconi (2009, p. 305)). SMT1…SMT6 have a sound foundation in the pivotal paper and books about stakeholder view (Freeman and Reed 1983; Freeman 1984, 1994; Wicks 1996; Freeman et al. 2010). SMT has been widely discussed, applied and debated in extensive literature in management fields. 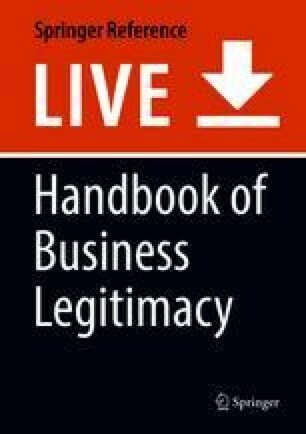 In particular, several critical questions about the ethics of business legitimacy have been posed (Rusconi 2009, 2018). The most important (and arguably the key issue for SMT) is understanding the connection between ethics and business; therefore the strict connection represents a useful key aspect for this analysis. In this chapter, we focus on the ethics/business relationship from the perspective of accounting ethics’ legitimacy. If we consider the work of Suchman and his classification of the forms/types of legitimacy, it could be observed that, unlike the pragmatic legitimacy, the moral form of legitimacy is “sociotropic,” that is, it does not draw on the judgments about whether a given activity benefits the evaluator but rather on the judgments about whether the activity is “the right thing to do” (Suchman 1995, p. 579). As explained by Suchman (1995), the moral legitimacy “may involve either affirmative backing for an organization or mere acceptance of the organization as necessary or inevitable, based on some taken-for-granted cultural account” (Suchman 1995, p. 583). Hence, the pursuit of social-public legitimacy is not necessarily seen as an ethically grounded behavior, because the respect of rules, law and ethical-accepted customs could not be ethically justified. On the other hand, the fact that SMT considers the conformity to ethical principles not only as an external limitation but also as an opportunity for implementing a sustainable business implies that the different ways of achieving legitimacy (in particular the instrumental and moral ones) could be indistinct. In this case, it would be possible to achieve a moral legitimacy by behaving ethically because ethics and sustainable business are seen in this situation as synergic aspects. How is ethical behavior related to accounting involved in the legitimacy pursuit process? Is it possible to achieve a real ethical and not only pragmatic/instrumental legitimacy? How is this research relevant both for business and ethics? In order to address these interconnected issues/questions, a conceptual model is proposed that is the result of a “metaphorical merger” between an application of the so-called ethical firm system theory (Rusconi 1997, hereafter EFST) and SMT (see Rusconi 2018 for this merger). It is argued that these two theoretical perspectives are complementary, because both view ethics and business from a synergic positive relationship, and they reject any kind of separation thesis (Freeman 1994; Wicks 1996) and reduction of ethics only as an external constraint. The firm is a stakeholder system. Each of these principles is discussed below in more detail. A firm is conceived as a unitary system of stakeholders (top management and entrepreneurs included) and could be thought as ethically responsible, especially for their “deciders” (usually top management), and this responsibility is also connected with their legitimacy toward all stakeholders (principle 1). Each stakeholder group identifies/constructs (almost implicitly) maps about their relationships with other members of the firm system (principle 2). A stakeholder management approach must aim to find an equilibrium based on a “minimal mutual acknowledgment” (hereafter MMA), regarding at least a satisfactory well-being for all stakeholders (principle3). Not respecting MMA towards some stakeholders could put the legitimacy and the sustainability of the firm at stake, so that managers have to follow the fundamental synergy between ethics and business which is the key point of SMT. With regard to principle 4, this is not relevant for financial and social accounting, because the principle concerns management and business decisions and not transparency, trustfulness and neutrality in complying with accountability duties toward all interested stakeholders. Absolute or pure ethics – concern the moral principles to be dealt with by the individual, or group of individuals, involved with business decision-making. In certain instances (which are rare if the viewpoint is not too narrow-minded), such principles could possibly conflict with the development of a success strategy, in which case a suboptimal ethical strategy might be developed (Rusconi 2018, p. 6). The possibility of suboptimal decisions is nevertheless reduced as far as top managers and entrepreneurs are creative and aware of the future consequences for the firm of their politics (e.g., in absence of strong environmental regulations), but its possibility cannot be excluded, though could be a stimulus to be increasingly more proactive and enlightened. But what are the implications of this model for the relationships between accounting/accountability, business ethics, and legitimacy? Clearly, the ethics of accounting/accountability involves all the subjects who are responsible for the preparation of these accounts: the auditors, the standard setters, and the national and supranational (e.g., European Union) governments. However, in this chapter we will focus on top management, entrepreneurs, and the firm’s chief accountants: how and to what extent is the EFST-SMT perspective relevant? In the following we provide some reflections about how the proposed model could be adopted to avoid unethical behavior and improve the ethics of accounting/accountability processes. As far as regards management accounting practices and documents, these are not connected to accountability. Managers and entrepreneurs, as seen above, have to take account of some cases in which decisions about “measurements” can, though indirectly, impact on their legitimacy and ethics toward stakeholders. This is, however, not a question of accountability, so these situations are not discussed further here. Turning back to the context of financial accounting, one of the most important issues for ethics and legitimacy is connected with earnings management (hereafter EM), which is now considered not only in compliance with the law and accounting principles but, as we have seen before, can be covered in some cases, because of the subjective and discretionary politics of how to treat the accounting process. Excluding the situations of evident misrepresentations and fraud (such as Enron, Parmalat, or WorldCom), which are clearly very dangerous for the individual company and business, we focus on the manipulative use of the discretionary power of accountants. Managers and accountants can in some cases generate some estimated subjective advantage for the firm by adopting a moderate EM. Our proposed conceptual model, which draws upon a holistic view of the stakeholder idea, is a deterrent to EM because, in the respect of principle 3 (MMA), management should act by taking into account stakeholders (more or less implicit) mapping and decisions-making, by avoiding forms of manipulation for self-interested concerns. Some authors emphasize that EM does not represent transparent discretionary practices, because these “affect investors, employees, customers and the local communities, which is eventually reflected in corporate reputation and, hence, the market value” (Martinez-Ferrero et al. 2016, p. 305, who refer to Zahra et al. 2005). In particular, the authors sustain that “accounting practices could affect the value of companies, their stakeholder relationships, reputation and corporate image (Fombrun et al. 2000; Roychowdhury 2006)” (Martinez-Ferrero et al. 2016, p. 305). Therefore, the application of a more holistic view of stakeholders could help to prevent some ethical short-sightedness of accountants and managers and to avoid practices that could jeopardize the legitimacy of their role and the accounting practices adopted and/or implemented. Some firms practice another managerial behavior that is not compliant with ethics, though not easily seen by the general public: the so-called macro-manipulation, opposed to micromanipulation like EM (Gowthorpe and Amat 2005). This practice is clearly against the principles of neutrality and completeness. Lobbying accounting principles jeopardize a possible pursuing of pragmatic legitimacy only if it can be clearly discovered, especially if the lobbied principles come from law or professional regulations. In any case it has a consequence on the unfair and unequal position among stakeholders, so that, sooner or later, if discovered can delegitimize firms and even accounting practices. The EFST-SMT perspective, like with the EM case, can therefore contribute to prevent this risk of future delegitimizing. The remaining issues of whether the dialectic between strategic and pure ethics, which is introduced by this stakeholder view of the EFST model, can help to shed light on the different forms of legitimacy, i.e. particularly pragmatic and/or moral (Suchman 1995). Though we assume that stakeholder approach can stimulate firms to reduce and/or avoid micro and macro-manipulation and to increase their legitimacy, there is still a need to consider whether this behavior is only a pragmatic (Suchman) means towards reducing the cost of capital, or it is related to moral consciousness: with regard to this, the strategic/pure dialectic EFST-SMT’s point of view is useful. An important and fruitful application of EFST-SMT could be a stimulus by “pure” ethics to a strategically instrumental one to be more ethically sound, because of its direct connection with “pure” ethics not with only pragmatic principles: this soundness could help to achieve a wider long-term perspective of the firm’s management. Turning back to social/sustainability accounting (hereafter SA), this has quite developed over the last two decades. Several important standards, though very often voluntarily, have been proposed. Ethics/legitimacy of SA needs more ethical focus than in the case of financial accounting. Although publishing this document could be seen as ethical and responsible per se, the multidimensional nature of these documents could favor micro- and macro-manipulation, even more than in financial accounting, that has for a long time been ruled by laws and accounting principles. Various principles and accounting/reporting standards have widely diffused, especially the Global Reporting Initiative (GRI (2018)) and Accountability 1000 (ISEA) process standard, whose aim is to be accountable to all stakeholders about the general impact of firms to them: economic-financial, social and environmental. In any case, following an ethical/legitimacy point of view, essential principles are completeness, no material errors, and neutrality (like in financial accounting), but inclusion has to be emphasized also. Inclusion is important because of the multidimensionality of social (sustainability) accounting, by using not only financial quantities but also narratives and other qualitative types of information. This approach makes the manipulation of data and information easier. This unethical behavior can, sooner or later, jeopardize legitimacy. Even if official laws or rules do not exist, discovering not neutral or not inclusive social reports could delegitimize the firm and even (like in financial accounting) all the credibility of the reporting process. With regard to the macro-manipulation, similar reflections, like those related to financial accounting, could be done. Defend ethical legitimacy by preventing some myopic social accounting process by taking account of principles 2 (taking into account the mapping by stakeholders) and 3 (pursuing a MMA condition). The strategic/pure ethics dialectics shed lights on the nature of pursued legitimacy; if it is moral or pragmatic, the second is less ethically sound in the case of less estimated risk of unethical behavior toward stakeholders. Put “pure” and “strategic” ethics in a positive and fruitful synergic relation, especially taking account of the multidimensional character of SA. In this chapter, we have addressed the issues related to the “ethical” foundations of accounting and accountability practices, for the purpose of envisaging accounting/accountability practices which are really for the interests of society and stakeholders. In particular, we have contributed to this debate by introducing a conceptual model that is able to illuminate some of the complexities of the relationship between accounting/accountability and business ethics. In particular, the model, which is the result of a metaphorical merger between a specific version of stakeholder theory and a systemic view of business ethics, is able to provide insights for improving the ethical foundations of accounting/accountability processes and to ensure their legitimacy. It emphasizes that firm’s accountants are in a system, where other stakeholders “make their accounts,” so that legitimacy, of both a single firm or the whole business, should be always considered at risk of not legitimate, both with clearly aggressive and smoothing accounting manipulations. The legitimacy of firm’s accounting practices is fostered by the awareness of the dialectic “pure”/strategic ethics, in order to provide an instrument for better understanding the difference between pragmatic and moral compliance. This helps accountants to open their minds, because of the stimulus of “pure” ethics to look for satisfactory and creative ethical solutions and, on the other hand, to let ethics experts be aware of real questions in accounting practices. So in conclusion, speaking about ethics of accounting is at the same time simple and complex. It depends on the degree of the depth in which such issues are addressed. In a very simple way, it could be thought that being ethical and legitimate means only respecting laws and accounting regulations. On the other hand, considering the discretionary margins pose much more problems both for ethics and genuine accounting legitimacy. The proposed model, first emphasizes the dialectic synergy between ethics and strategy, in connection with the SMT’s idea of synergy between ethics and business (Freeman 1994). This supports managers to take into account several subjects who are involved in the financial and social accounting, as an ethical disincentive against hidden frauds or window dressing. Second, the model incentivises scholars and practitioners to look for situations where ethical compliance could not be real moral legitimacy, but it is only the way to pursue pragmatic legitimacy. This chapter calls for future research to study, where and when, in accounting, it is possible to distinguish the different accounting practices toward legitimacy.